The most popular Warcraft 3 TFT mod DotA-Allstars has received a yet another patch DotA v6.78 by its developer. The new version brings 2 new heroes to the Radiant/Sentinel side and required balance changes to stabilize the gameplay. The changes of 6.78 will be ported to Dota 2 (remake by Valve) for its annual eSports tournament called The International 3 with a prize pool of $2 Million USD. Description: Brings additional content and balancing to DotA mod of War3 TFT. Changelogs: Read Dota 6.78 Patch Notes. 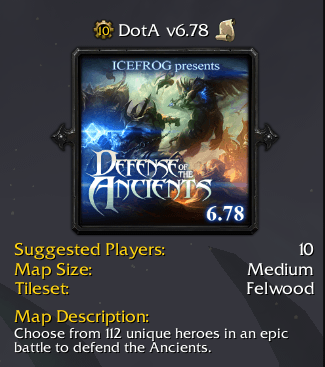 • DotA 6.78 AI will take couple of weeks to release. • After downloading the w3x file, put the map in Warcraft III\Maps\Download folder.